* We’re sorry for the poor quality of the sound. We did the best we can improving it. This panel was just too insightful for us not to share it with you. So this would not be the best episode to listen to while you’re biking or in traffic, but certainly worth putting the time in to hear it! Hi, I’m Sagi Shrieber, Product Design Director at a scaling startup, and with me (in the same company) is David – a Front End Developer lead. We are also both entrepreneurs, bloggers, productivity/time-hacker maniacs, and all around tech geeks. So you see – these are the topics that we would probably discuss in the Hacking UI Podcast. If you’re into what we’re into – we would love for you to join us on this podcast and think you’ll find it super interesting! In this season – which we called ‘Scaling a Design Team’ – we will be talking to great designers from top notch product companies to discuss team structures, responsibilities, and workflows. We’ll also be talking to them about design management, hiring, and culture. This is a chance for us to get an inside look at some of the best design teams out there and to understand how they fit in at different companies. I Love this podcast – now what? Show your love #1 – Talk: Talk about it with friends and get the word out! We started this podcast in order to learn and would love to see others learn from it too. Show your love #2 – Leave a review: Review us on iTunes and tell us which guest you’d like us to bring on the show next. When you review us it lets us know that you like the show and that we should keep doing it. 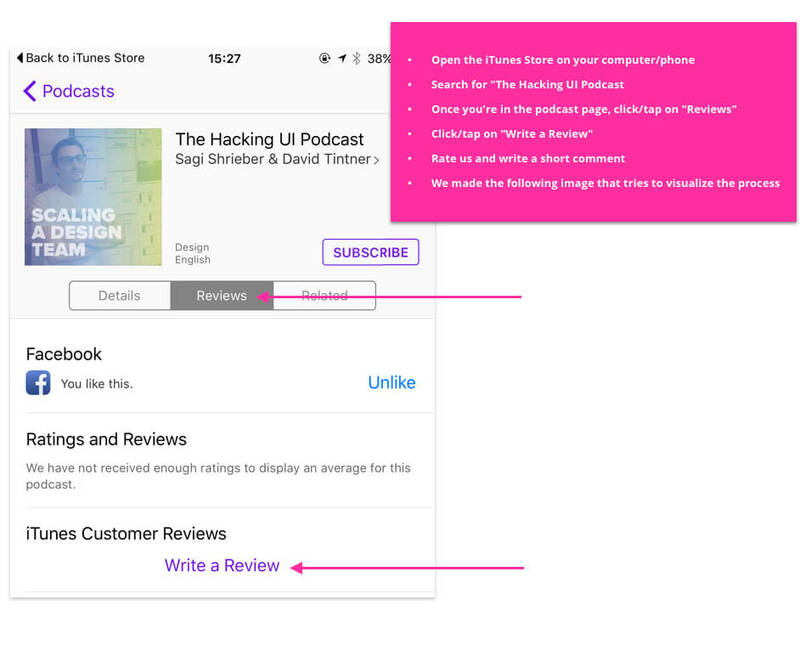 Check out the following image, which describes exactly how to leave a review in one minute. This November we teamed up with Design&Startups and launched a free product design panel event, discussing product team structures, responsibilities, and workflows. 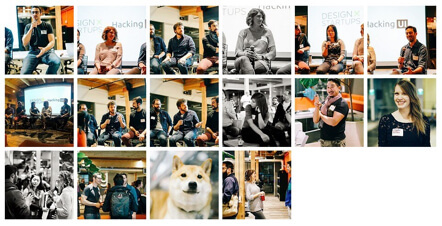 It was an amazing experience for me hosting the first ever Hacking UI event in San Francisco. The panelists were amazing and listening to what they had to say was super insightful! The event took place at Galvanize on November 16, 2015, and was sponsored by Similarweb and Invision. The program works in batches, with only 3 batches per year. Registration for the next batch of the Side Project Accelerator is now open until November 10th, and there are only 50 seats available. Apply now to reserve your spot. A Product Designer at Uber, Derek previously worked at Lumosity. He’s held multiple roles helping to design a variety of web and mobile apps, large and small. Hobbies include biking, hiking, putting together IKEA furniture and writing witty bios. Corey is a Product Designer at BitTorrent, where he advocates for 180M users across the world. He is currently designing a new web browser aimed at creating a better internet, powered by people. Corey has led and worked on design teams large and small — from creative direction at NBC to working with small non-profits in Sierra Leone to organizing access to local regional transport in South East Asia. Corey believes that great design lies in interpretation: combining the goals of the people enjoying your creation and the dreams of the team building it. 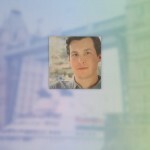 Bernat Fortet is an Experience Designer at Aviate (Yahoo). For the past 2 and half years, Bernat has focused on how users interact with personalized experiences. Since then he’s driven initiatives to strengthen the connections between designer and engineers through the creation of new design tools. Bernat has also been driving changes in the design organization by defining what we stand for as designer at Yahoo in order to have strong voice across the company. Lan is a UX researcher on the Facebook Ads team. She started her UX career designing for enterprise healthcare software. After a few years of working as half UX designer and half UX researcher in various digital agencies, Lan decided to focus on UX research. Prior to Facebook, she was a Design Researcher at IBM Design helping design enterprise mobile platform. She received her Master degree in Human-Computer Interaction from Georgia Tech, and Bachelor’s degree in Computer Science from Rensselaer Polytechnic Institute. Melissa is a Design Manager at Facebook. Currently leading the design team responsible for connecting the next billion people to Facebook (no pressure). Prior to Facebook, she designed a diverse range of products at start-ups, consultancies, and Apple, where she led design for iBooks and media management software for Final Cut Studio. Assaf is an Interaction Designer at IDEO. Passionate about molding a big, broad idea into a living, breathing product—the kind that users can’t put down. Before joining IDEO, he led the design for an Inc.500 listed DIY website platform. Today he’s proudly helping to reshape the digital face of education as an interaction designer at the Design For Learning team at IDEO. He makes killer hummus. He prefers to capitalize Hummus. Sagi is the Co-founder of Hacking UI, and is now the Director of Product Design at Similarweb after they acquired his previous startup Tapdog. Sagi is also a UX Mentor at Google Campus, and founder of the popular Israeli design blog Pixel Perfect Magazine . Paige is a freelance Visual Designer & Illustrator, and a co-founder in the Design&Startups meetup group/community. Co-Founder of Hacking UI. Designer, Entrepreneur, Husband and Father. Read story here: "How we Built & Scaled Hacking UI as a Side Project"